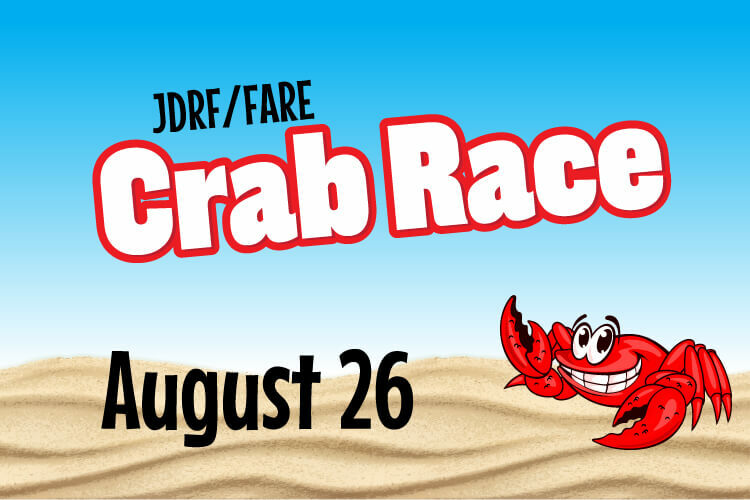 On Saturday August 26th (raindate August 27th) at 5:00pm, artificial plastic crabs will be released from Patriot’s Plunge into the Revolutionary River at Breakwater Beach in a race to benefit Juvenile Diabetes and Food Allergy Research Education. You can purchase your “crab” for only $5 in the waterpark any day we are open! Each donation, IF PURCHASED PRIOR TO AUGUST 19th, receives a Twilight Admission for the day of the crab race. If you purchase your crab between August 19th - August 26th (noon), you will be entered to win prizes but will not receive admission to watch the race. Winning crab gets $100 and a 10 All-Day Passes to Breakwater Beach for the 2018 season. LOTS of other prizes will be awarded too. If you have a Crab Race Twilight Admission that you received with your donation you can upgrade to an all-day admission for the day of the Crab Race if you would like. Bring your Twilight Admission SURF card to the Admission Windows anytime of the day tomorrow (10am-3pm) and can upgrade to an all-day admission for $20! Only valid day of the race - August 26th. If you wish to just come for twilight, we will begin Twilight at 2pm for those who have the Crab Race Twilight Pass.